Study Sets are time-savers built into SlopeCharts which allow you to apply multiple studies, with customized values, instantly. You access them the same way you do any technical indicators – by clicking the Studies button – and on the extreme left of the dialog box you will see the choice for Study Sets. 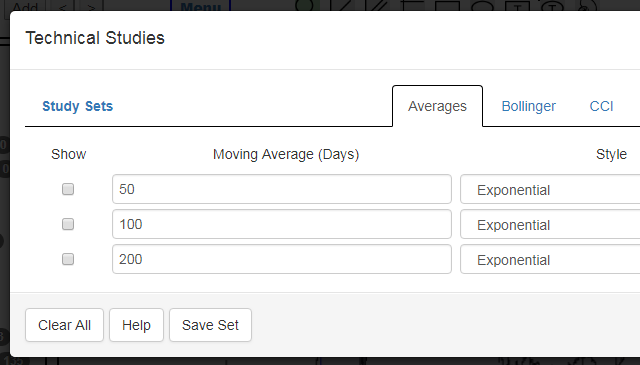 (You can also save a set without going to Study Sets just by clicking the Save Set button). Creating a study set is extremely simple. Just choose whatever studies you want, just as you normally use the Technical Studies dialog box. When you are ready, click Save Set. You then give the set a name. You will want to give it a meaningful name (not “Study Set” or “1”, but more along the lines of “Multiple Exponential Averages” or “Cyclic Indicator Trio”). When you save the set, you can either save it as a new set (left side) or update the settings of an existing set, thus overwriting whatever is there already. In the example below, a new set is created. 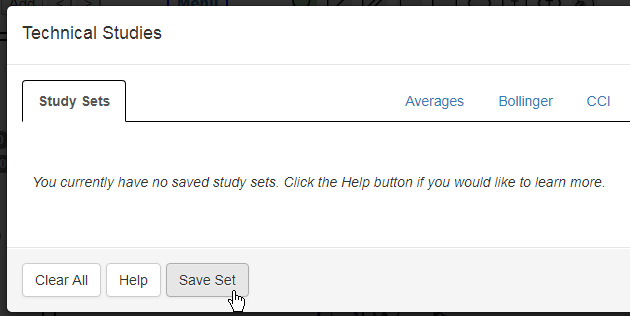 Accessing these sets is a one-step process: just click the blue Load button to apply all of those studies to your charts. All of the sets you have created are listed by name along with a automatically-generated description of what the set contains. You can also get rid of any unwanted set by clicking the Delete button. By making use of Study Sets, you can create sophisticated libraries of technical indicators with any customized values you want. Instead of having to hand-pick studies one by one, modifying the indicators at each step of the way, you can instantly use all of your carefully-tuned groupings by just one click of a button. During normal use of SlopeCharts, there are a couple of quick ways to access study sets. One, you can access any of them via the Analysis menu, or two, you can choose any of them from the Data Panel on the left side of the SlopeCharts screen.